How cool! I’ll have to show this to my little girl. We were reading a book about this just last night. Oh gosh that is a great find but a bit ugly. I is in agreement with Lilli. Great shot and thanks for the nature lesson! That’s an interesting photo. He does seem too mature to still have that tadpole tail. Awesome shot! Amazing that the cells are programmed! I remember going out and catching tadpoles when I was little and some of them had legs but still had their tails. Kind of weird looking. It’s amazing that you spotted that little guy. 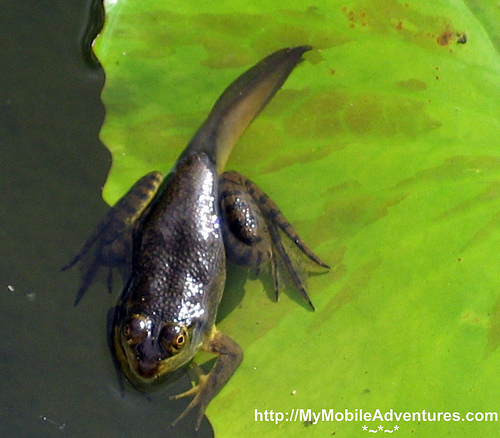 Years ago for Boy Scouts Nick and I raised tadpoles up to frogs. Then killed them. Not being a frog expert I didn’t realize I actually needed to feed the frogs. I mean, the tadpoles ate whatever was in the water, I just expected the frogs to as well. Oh, I was so young and dumb. (I’m much older and dumber now). 🙂 Anyhow, I don’t think he’s ugly ’cause he’s alive! Really great shot and info! Thanks for sharing them. What a really cool image Tink! My post this week is on my photoblog: Carletta’s Captures. Whoa, that is weird! Probably a bit of an anomoly like an albino but not!!! What a unique photo! You did seem to catch a frog that looks a tad mature to still have a tail. VERY cool. And thanks for teaching me a new term: apoptosis. Neat photo capture! Thanks for sharing. I guess even frogs need security blankets, eh? Very cool entry. Hi, Tink. I’m a bit late in visiting my Camera Critters friends, but just wanted to say how much I like this photo. Very interesting post!